Preferred Habitat: Woodlands and suburbs, often close to water. Seasonal Occurrence: Abundant December through March. Lesser numbers are found other times of the year. Southern subspecies breeds in our area. Profile by Kayla Ferron: The American Robin is a large gray-brown songbird with warm, brick red underparts, darker head, and broken, white eye ring. 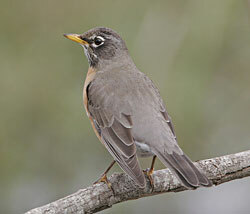 Robins are the largest of North American thrushes and they offer a good chance to learn the shape of most thrushes. They have a large, round body, long legs, and a fairly long tail. In flight you can observe a white patch on the lower belly and under the tail. Females have paler heads than males that contrast less with their gray back. Their song consists of rich caroling notes, rising and falling in pitch. They are common across the continent in gardens, parks, yards, gold courses, fields, pastures, tundra, as well as deciduous woodlands, pine forests, shrublands, and forests after fires or heavy logging. American Robins are ground foragers and eat large amounts of invertebrates and fruit. They run and hop across open lawns locating earthworms by sight. In spring and summer they eat many earthworms, insects, and some snails. Their diet also includes a variety of fruits, including chokecherries, hawthorn, dogwood, sumac fruits, and juniper berries. While rare, they also have been observed to eat shrews, small snakes, and aquatic insects. In winter many robins move to moist woods where berry-producing trees and shrubs are common. Robins eat different types of food depending on the time of day, more earthworms in the morning and more fruit in the afternoons. Because it forages on lawns, it is highly vulnerable to pesticide poisoning and is an important indicator of chemical pollution. During fall and winter, robins often roost in large flocks and spend more time in trees. In spring, males attract females by singing, raising their tails, and shaking their wings. Females choose nest sites usually on one or several horizontal branches hidden in or below a layer of dense leaves. The nests are built from the inside out, pressing dead grass and twigs into a cup shape using their wings. Then the nest is reinforced using soft mud and lined with dry grass. Eggs are sky blue or blue-green in color with clutch size being approximately 3-5 eggs. Both parents feed the young and are very aggressive in defending the nest. Young leave the nest 14-16 days after hatching. Males tend to the fledged young while females begin the second nesting attempt. American Robins are seen year-round in most of North America. Come visit our sanctuaries to see one of these birds! 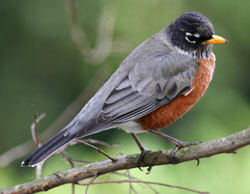 Notes about robin subspecies by Robert McFarlane: American Robins are divided into two subspecies. The Eastern American Robin, Turdus migratorius migratorius, is our common winter migrant. The Southern American Robin, Turdus migratorius achrusterus, is a permanent nesting resident. It is far less common. According to Oberholser, compared with the Eastern American Robin, the Southern subspecies is slightly smaller, duller and paler. The black feathers of the head (pileum) plumage are mixed with gray. Back feathers have a brownish cast. These marks are clearly shown in Greg Lavaty's photo which was taken at Quintana in July of 2006.